Adobe’s CTO paints a rosy picture of the platform. But that’s his job. The reality is what many of us see with our own eyes: Flash is a massive pain point in our day to day computing. If it’s not crashing our browsers left and right, it’s causing our computers to cook our thighs (or worse). If it’s not draining our batteries 33 percent faster, it’s opening gaping security holes. Let’s look at just the most recent headlines. Yesterday, Apple released the latest OS X update, 10.6.5. A huge portion of the update was dedicated to security updates. 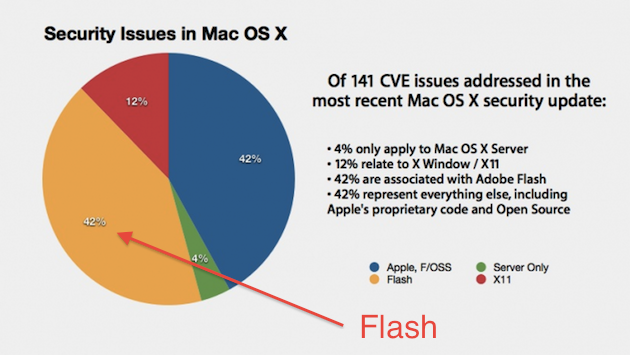 Of those, a full 42 percent were security patches related to Flash. Should anyone be surprised that Apple has decided to no longer bundle it with OS X? Meanwhile, Flash is now fully baked into Google’s Chrome browser. If you read the update notes or bug reports on the various channels, you’ll see that a massive number are related to Flash. What about Flash on other devices? It’s the killer feature of the new Samsung Galaxy Tab, right? Wrong. Even the most glowing reviews of the new tablet rip its Flash support. Meanwhile, on the smartphone side of things, Adobe just released an update for Flash for Android likely ahead of the 2.3 roll-out. Does it fix any of the performance issues? Nope. I’m using it right now. Playback is still jittery as hell. So you’ll forgive me if when Kevin Lynch announces all these great-sounding things about Flash that are just around the corner, I’m highly skeptical. How long have we been promised Flash on mobile devices? 5 years? It’s still not where it needs to be. Hell, it’s not where it needs to be on the desktop. The fact of the matter is that if everything was peachy keen in the state of Flash, Adobe wouldn’t have anything to worry about. Apple could go on the offensive against them, but it wouldn’t matter. Nothing would change. But things are changing. And Adobe is scared to death. But all of these reports across various sectors must be wrong. Flash is just great. People are screaming about how wonderful it is. It’s a pure coincidence that they all happen to be Flash developers.